We were the FIRST and at this stage we are still the only breeders in WA to Import this extremely rare breed of LAGOTTO ROMAGNOLO from the Country of Origin - ITALY - into Western Australia and we are extremely proud of having been able to do that, not only for our breeding, but to help others too. I have been involved in breeding and genetics for over 30 years. Initially in the UK and for the past 30 years in Australia. It is our intention to concentrate on the bloodlines and breeding over the coming years. Breeding to ensure type is more recognised in this breed, which is no easy task, given the still rarity of the breed in Australia. We have a responsibility, I believe, to breed to the standard and maintain the integrity of the breed by doing so. To do that, for me it means concentrating on going back to studying the genetics of this breed, and it may take me a lifetime to get there, but I do hope by doing so, and concentrating on breeding to the standard, we at Nugold are able to breed more consistently to that standard so that people get the chance to see more of this truly remarkable breed. We will have the ability to show most of the colours ie off white and orange, solid orange, brown roan, off white and brown, solid brown - which will allow visitors to the dog world to see not only how beautiful this breed is, but the different colours available. It is extremely important to us that we ensure that this breed remains true to the intentions of those Italian Breeders who have now allowed us to be part of this wonderful breed. Ensuring the breed standard is maintained by type, height, weight, coat (the curls in the coat are most important feature of the breed). We are all relatively new in Australia with this breed, and interpretations on what is and is not correct, is an area that we need to be vigilant with. The Lagotto Romagnolo are excellent companions and are a true pleasure to have in my life. I am blessed that I can be part of introducing this stunning breed into Australian homes! This breed are amazing. They are just the most beautiful dogs, excellent in temperament, love being part of the family - yet love their own space as well! Enjoy their walks and the beach, yet can also be happy to just potter around - that is just amazing to me. Gentle in nature I have yet to fault them. Okay, clearly I am biaised!! At this point I have also been extremely blessed as they seem to be a very hardy, healthy breed. The only issues I can say I have been involved with are ear infections - and that seems to come about through not drying them off properly after they have been swimming in the beach along with not removing the hair in the ear canals effectively! What can I say about the Golden Retriever? Everyone knows what a wonderful breed they are and how great a family pet they are as well. It is good to be back with my Goldie and I am truly blessed with both these breeds. We strive to do the best we can with the information we have about the dogs that we breed from. Placing puppies in new homes is a huge responsibility, which we take very seriously. A dog is for life and having been there from the start, we do our best to ensure the homes we place our puppies in are the best, loving homes. We raise our babies in our home, they are part of the family and I really enjoy the time I have with them as babies...it all goes far too quickly for my liking! It is our intention to be responsible and caring breeders and dog owners. Extensive research is undertaken before doing any mating to ensure that we know as much as we can about the history behind the puppies we breed. Every care is taken to do the best we can to bring into this world beautiful companions who are true to their breed characteristics. We are small family breeders, whose dogs are part of the family. Our emphasis is on breeding to the highest standard we possibly can achieve. This have involved many years of research, before importing new bloodlines to Australia. This is to ensure that the animals we have are from excellent bloodlines, are healthy and have had all the right tests. With such a small gene pool in Australia, we believe we need to import for the future good of this breed in Australia. We are also blessed that we can be entrusted with such precious animals by those breeders who will allow us to import to Australia. We thank you! 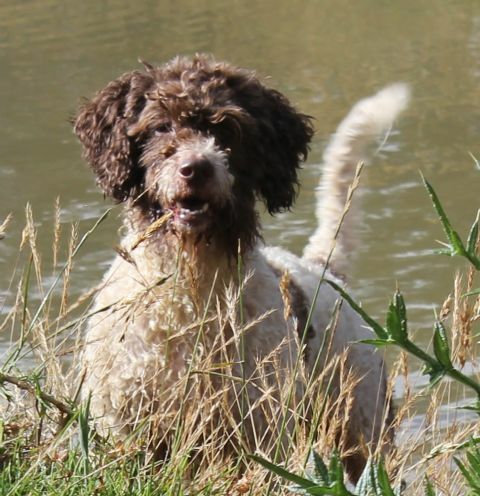 We are always available to chat about either the Lagotto or the Golden Retriever and if we can be of any assistance - just for advice or information, please do not hesitate to contact us.